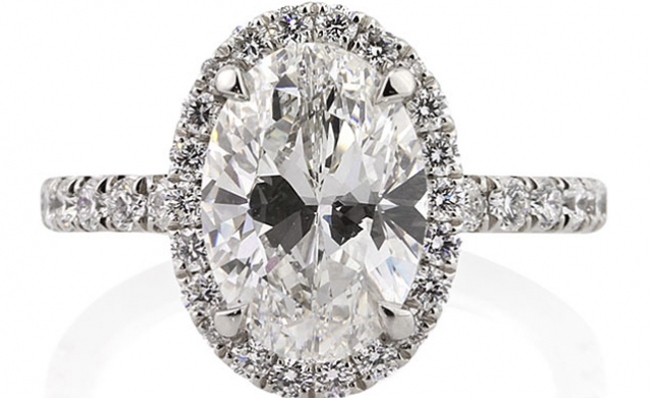 Traditionally couples choose a diamond ring as a symbol of their love and promise to marry. For couples who want to stay away from traditions or who prefer other gemstones, there are other options. Several other gemstones work very well as non-diamond engagement rings. 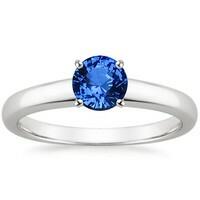 A sapphire is one popular choice and the beautiful gems come in a variety of colors. Jewelers who create custom rings as well as most other jewelry shops have all types of gemstones available as engagement rings. 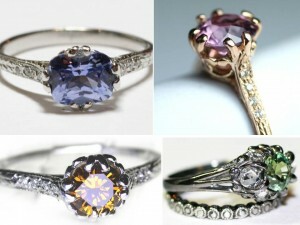 Many of the rings have accent diamonds along with the gemstones. The striking pink sapphire adds a romantic touch to the beautiful ring with the graceful Celtic knots that frame the round gemstone. The band has a delicate line of accent diamonds on each side of the center stone next to the knots. 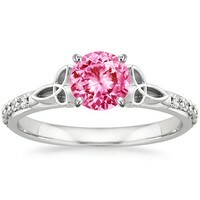 The pink sapphire is in a four-prong setting. The ring is available in platinum as well as 18k yellow or white gold at Brilliant Earth. This ring has a classic design and understated style. The solitaire blue sapphire shines from the center of the band. It features a four-prong setting and rounded edges for a comfort fit. The band is available in platinum, 18k yellow gold, and 18k white gold. You can find the ring at Brilliant Earth. This ring has an elegant band with delicate strands that twist together entwining in simple beauty. The solitaire stone is a Ceylon sapphire. It has a four-prong basket setting and there is a rhodium finish on the band. Options for the band are 18k yellow or white gold and platinum. The ring is available at Brilliant Earth. 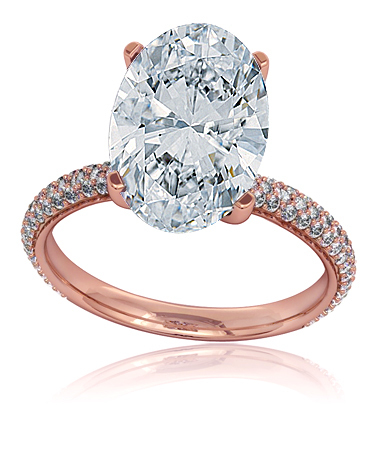 A soft and romantic oval pink morganite is the solitaire center stone on this slim band. Six small round accent diamonds adorn each side of the band. The sterling silver band has a polished finish. This delicate looking rind is available at Ross Simons. 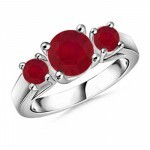 Three rubies gracefully adorn the top of this polished band. The center ruby is larger than the two side stones for a balanced look. Options for the material of the band are silver, 14k white gold, 14k yellow gold, and platinum. The ring is available at the Angara web site. A hand engraved band with delicate milgrain and scrolls that cover the sides and top offers a vintage look. 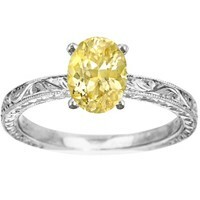 The stunning yellow sapphire glitters from the center of the ring in a four-prong setting. 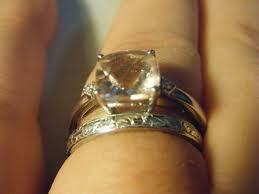 The ring has a rhodium finish. The ring is available in 18k yellow gold, 18k white gold, and platinum at Brilliant Earth. A pale blue oval aquamarine stone is the focal point of this beautiful engagement ring. Framing the stunning stone on each side is a cluster of three small round accent diamonds. The 14k white gold band has charming open worked detailing. The ring is available at Ross Simons. 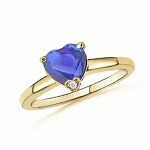 The medium violet blue of the heart tanzanite stone shines with a romantic look on this non-diamond engagement ring. A small round diamond accents the point of the heart. The ring is available in 14k yellow gold, 14k white gold, sterling silver, and platinum. This sweet ring is available at Angara. The oval amethyst glitters deep jewel tones of purple in this exquisite ring. Clusters of three small round accent diamonds frame the center stone in understated elegance. There is an open shank on the band. The 14k white gold ring is available at Ross Simons. The deep green of the oval emerald on this 14k white gold band shines brilliantly. One small round accent diamond adorns each side of the glittering emerald. The slim band has a polished finish for an elegant look. 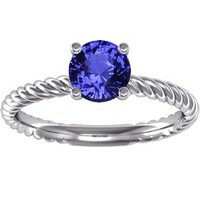 This bright ring is available at Ross Simons.